00:28:00 Makes 4 servings, two topped peach halves (138 g) each. Makes 4 servings, two topped peach halves (138 g) each. These poached peaches are like summer in a bowl. 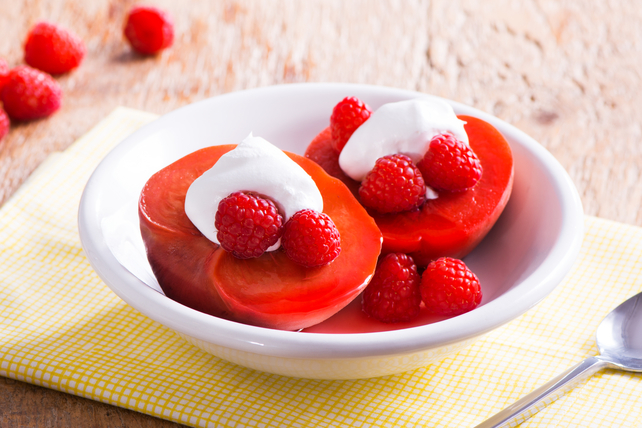 Juicy peaches and ripe raspberries are topped with COOL WHIP for this quick and easy fruit dessert. Mix dry jelly powder, apple juice and water in Dutch oven. Bring to boil on medium-high heat. Cook until jelly powder is completely dissolved, stirring frequently. Place 2 peach halves in each of 4 individual dessert dishes; top with 1/4 cup of the raspberries and 2 Tbsp. of the whipped topping. Substitute nectarines for the peaches and/or sliced strawberries for the raspberries. Prepare peaches as directed; cool. Cover and refrigerate several hours or until chilled. Top with the raspberries and whipped topping just before serving. This fruit-filled dessert is a good source of vitamin C.
Serving Size Makes 4 servings, two topped peach halves (138 g) each.